Blue Mountain Feeds is the world leader in ratite nutrition solutions and production management systems essential for profitable ostrich and emu production. Blue Mountain Feeds works in partnership with our customers to enable them to achieve cost effective production. 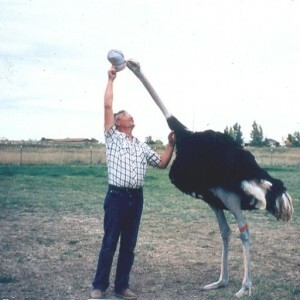 Blue Mountain Feeds is a unique feed company that specializes in Ostrich and Emu feeds. Our formulations have been very successful to support high egg laying, excellent hatchability and good chick survivability with growth rate and feed conversion still unchallenged within the industry. The success of the rations is mainly because of the careful formulations and productive levels of supplemented minerals, trace minerals and vitamins in our formulations. Blue Mountain Feeds recommends and formulates only productive ingredients such as the highest quality alfalfa, grains, and protein supplements as ingredients in our formulations. This strict attention to ingredient source regime and manufacturing quality control detail has resulted in many satisfied customers who are excellent testimonials to the productive performance of our rations. Our Founder has written many articles, studies, trials and other interesting information to provide a greater understanding on how to apply modern livestock science and technology to ratite production to achieve cost effective production and high quality products. Please contact if you are interested in working together in a scientific and detailed manner to resolve issues on your ratite farm.